From the Orioles to the sandlot and all levels in between! Mulling over the past few weeks, it’s interesting to see the similarities and differences between doing ministry within the game of baseball. I had the opportunity to spend a few weeks in Rochester, NY with the Rochester Ridgemen, one of the Athletes in Action teams in the New York Collegiate Baseball League. During those two weeks I walked through scripture with the team, teaching on theology, Spiritual life, work of the Holy Spirit, life of Christ, etc. while trying to lead the guys through seeing spiritual life through the lens of the game. Articulating spiritual truths in a way that baseball players understand and connect with, illustrating the depths of Scripture with the game of baseball. Now we are back in the DR. Wednesday spending a few hours in the Orioles academy, with 17-23 year old professional players, connecting the game of baseball with the power of the Gospel and this morning being spent on a sandlot field in Boca Chica with kids ranging from 4-12 trying once again to articulate spiritual truths by illustrating with the game of baseball. Sure, the language (Spanish and English) changes, the context changes (beautiful turf fields to trash filled cow pasture), but the game and the Gospel remain the same. There are still four bases and a mound and Jesus is still the redeemer of souls and the giver of life. The Gospel has power on the sandlot, the Orioles academy and in the NYCBL. Jesus is God in all, and can use a trivial game to bring Himself glory. Ubaldo Jimenez threw a horrible pitch to Edwin Encarnacion to end the American League Wild Card game. As I was watching the game I saw the ball come out of his hand and knew that the game was over. 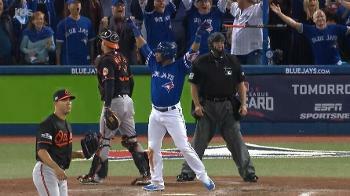 Whether or not Encarnacion hit it as hard and far as he did, I think most people saw the result coming. As we look at the picture above the world tells us that Encarnacion, winning a game in such dramatic fashion, hitting a baseball as far as he did, is a mark of true manhood. However, I believe walking off that mound, as Jimenez did last night, is a critical moment in the life of a man. You see, baseball teaches us a lot about failure. Failure is part of the process of growth for a man to reach his true identity as a man. 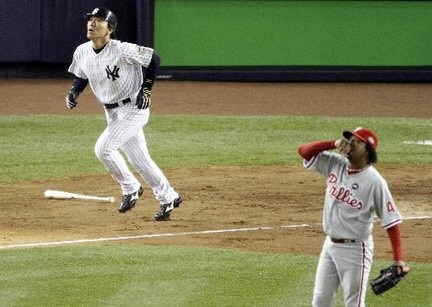 To walk off the mound, in front of 50,000 people going crazy because of your failure is a defining moment. While most of us will not get to experience this moment. All men will go through something in life that will challenge them, and cultivate them into the man they are molded to be. When we look at the life of Jesus, the mark of true masculinity, we can see this moment come through multiple times. Specifically, I want to draw us to look at Christ’s moment in the Garden of Gethsemane as a defining moment in Christ’s life. Jesus experience here shows us that true masculinity, a masculinity that is devoted and fully committed to the King of the Universe is a masculinity that is tried through hard things. A masculinity that is honoring to God is one that takes on challenges, that takes on failures, that brings us to the end of ourselves, is a masculinity that God is calling us into. How can baseball help us shape that masculine heart? As we deal with strikeouts in key situations, giving up walk off hits, errors on routine plays, we can stand encouraged that however small these things are, they are challenges that are shaping our heart into the masculine heart that God desires. So much of what we do as athletes is compare ourselves to others. We walk out on the field and immediately size up our competition. We look at how hard they throw, how they run, and how their BP looks, and we make assumptions based on their performance in comparison to ours. 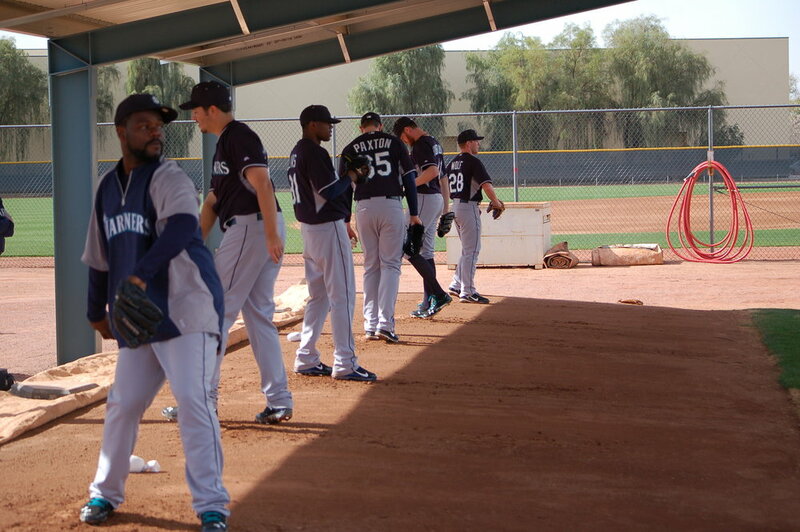 The other day I was watching two pitchers warm up in the bullpen. They were throwing side by side, and you could see their own pride swell up as they compared how hard they were throwing to the guy beside them. This is natural, and as athletes we are bred to think in this manner. We are constantly evaluating the performance of others, and our own performance, and hoping that our performance outweighs the performance of our competition. While the baseball world teaches us this, the Gospel teaches us the opposite. In a spiritual sense, our works, actions, deeds, and “fruit” are ultimately worthless as we compare them to the righteousness of God and His perfection. As we place ourselves next to a holy God we are constantly reminded of how far we fall short. Last night I was sharing with a team, talking through the Gospel and what Jesus did. I was reminded as I was reminding them, about how far I fall short, how worthless I am, how great Jesus is, and how beautiful is His perfection! If we believe the Bible, we must believe we are “dead” (Ephesians 2:1) and ultimately are only made alive by the grace and mercy of Christ (Ephesians 2:8). As dead people compare themselves to all the other dead people around them we realize we are all dead. Death compared to death is still death. What a beautiful Savior we have that took dead things and made them alive! I remember my senior year of college baseball. I had made the transition from catching to pitching, and was throwing in a relief role typically towards the end of games. My junior year I had thrown around twenty innings and had a lot of success. I made the transition to the mound toward the end of the year my junior year and wound up with a 1.something ERA and pitched well. Going into my senior year this gave me a lot of confidence, I felt like I could get people out, attack hitters, and rely heavily on my fastball (since I had subpar off speed stuff). Over the course of my senior year, my arm got hurt, my velocity dropped, yet I still relied on my fastball and believed I could pitch the same way I previously had. I wound up my senior year with a 5.plus ERA, and had two grand slams hit of my in late inning situations. My previous success gave me unrealistic confidence, and a naive mentality about my own ability. My own success was my downfall. My false confidence set me up for failure, because I failed to be smart. I believe at times the Enemy can do the same thing. John 10:10 says, "The thief comes only to steal and kill and destroy, I came that they may have life and have it abundantly." At times we can be naive and feel that our own "success" sets us up to continue in that pattern. Yesterday Abbie and I did some relational counseling, we met with a couple to talk about relationships and talk about what we have learned. I believe Abbie and I have a good marriage and we love to connect with people on a relational level. However, after yesterday spending time talking about marriage, we proceeded to have a blow out fight at night. I believe this is the way the enemy works, he catches us at a point of relaxation and proceeds to creep into to attempt to destroy. If we do not keep our guard up, we allow this to happen, we allow our own comfort and success to encourage us towards complacency. Similarly, if in our last at bat we hit someones fastball over the left field fence, our next at bat we do not look for that same pitch and at times can get beat by it and look stupid. Keep your guard up. Thankful for Days Like This! Recently life has been a blur and I have not had to time sit down and write. I briefly got this on paper today and I hope reading this encourages you!For the last week and a half we have had my friend David Jones, who I played with at Southern Wesleyan, here with us. It has been a blessing to have him here, allow him to experience the ministry, see things he has not seen before, be able to engage with our staff here, and use his gifting as a former player and current coach to serve the ministry here in the Dominican. Recently, David de la Cruz, our leader of ministry in Santo Domingo, Ariel Eusebio Benitez (Boca Chica Staff), myself, and David traveled to Centro Olimpico to be with David de la Cruz, support what he is doing there, and serve in whatever capacity he needed us. After the first practice, David (Dominican) asked David (American) if he would be interested in sharing his testimony with the players and coaches. (While also throwing me under the bus as the translator!) This was a great experience across the board, and my first experiencing translating in front of a group. I have translated one-on-one or in small group settings, and spoke many times in front of groups, but have never had the opportunity to translate officially in front of a group. David talked about his experience as a player, the shift in his identity from David the ballplayer, to David the Christ-follower. After his testimony David de la Cruz reiterated some points and then led into a very clear presentation of the Gospel. That day seven players moved from death to life, accepted Christ as their Savior. One of the points that encouraged me the most was seeing Ortiz, the coach of the program, and someone David has been discipling for a period of time, leading the players through a prayer of repentance. As we were walking away, I started briefly reflecting on the experiences of the day. It almost seemed to me as if this is the way FCA DR is set up, supposed to be, and we saw it work almost seamlessly that day. One thing we have been pushing for a while now is the intentionality of discipleship specifically with coaches. We believe that the staff role is discipleship primarily, evangelism, preaching, and chaplaincy type rolls falling behind. Days like that solidify our thinking, that if we can disciple coaches, they can do things far beyond what we can do, because of the amount of hours they spend with the same groups of kids. As those seven accepted life, we can see Ortiz begin to take the reigns of discipleship, David by extension is still speaking into the lives of the players, still serving in a chaplaincy roll, but through his discipleship of Ortiz, those players are being led well, by a Godly man, who is seeking to use his platform as a coach to advance the Kingdom. Have you ever been a part of winning a championship? Most of us who have played or coaches for any extended period of time have found ourselves on a winning team at some point, whether it was little league, high school, college, professionally, coaching, or taking the crown at the wiffle-ball all-nighter. To win a championship takes work, but in the moment of victory, all other things fade away, the grind of the season, the sweat, pain, aches, and bruises seem to dissipate. Now that I am out of the coaching/playing world, I am around victory (baseball victory that is) on a much less frequent level. In fact it has been three years since I was a part of a championship run (coaching at Denver Christian High School), however this past week we had our FCA Team Camp here in the Dominican Republic. Where we had teams from Santo Domingo, San Pedro, La Romana, and Sosua playing to win a tournament championship. After the championship game, when Santo Domingo won it all, I was on the field with the team, talking with coaches, and watching the players interact as Isaiah ran the bases 57 times, and I started thinking about the idea of victory. This morning I revisited that idea in my devotional time as I was reading in 1 Corinthians. First Corinthians 15:57 says, “But thanks be to God who gives us the victory through our Lord Jesus Christ.” Now Paul is writing to an extremely screwed up church, a community that is trying to move towards Christ with the lingering effects of paganism, idol worship, prostitution, sexual debauchery, injustices and more hanging around in the lives of some of the members of this community. Throughout the letter Paul has strong words for many of the things that are happening inside of the church. But towards the end of the letter Paul leaves this screwed up community with these words, “But thanks be to God who gives us the victory through our Lord Jesus Christ.” What victory did the Corinthian church win in Christ? A victory far beyond any victory we can comprehend on a baseball field. A victory that took the disgustingness of their sin and made it white as snow (Isaiah 1:18), a victory that made beauty from ashes (Isaiah 61:3), a victory that says the same power that rose Jesus from the dead lives in them (Romans 8:11), a victory that conquered death (Revelation 1:18). The power of Jesus work on the cross took their sin and faded into distant memory. This is the same victory that we have in Christ. Celebrate, rejoice, dogpile on the mound, because you have won the victory, death and sin have no power over you, Jesus won the victory for us! Thanks be to God who gives us the victory through our Lord Jesus Christ! If you have played baseball for any amount of time you have run across your fair share of good coaches and bad coaches. But can you specifically identify why some coaches are good and some coaches are bad? Is it in the x’s and o’s, teaching ability, game management, poor people skills, or is it a combination of many of the above. I am not sure how many coaches are out there reading this, but I hope that you have thought critically about coaching and how you do what you do. In my 25 years I do not have a huge amount of coaching experience, I coached at Colorado Christian University for a short time, Denver Christian High School, and Hitstreak Academy all in Colorado during my time there, none of which give me the insight to speak on a great level to you coaches who have much more experience than I do. However in my few years of work experience I have been put in many leadership positions, and since moving here to the Dominican Republic and being put in a cross-cultural leadership position, I have reflected often on what I do, how I do it, why I do it, and how it bears fruit in leading people, which I feel speaks into both the leadership and coaching world. Currently there are a myriad of great resources out there that speak to the world of leadership. Many of these resources say a great deal, and many of them seem to contradict each other in strategy to get the most out of the people you are leading. However, I believe if we truly look at great leadership, we cant go further than looking at the person of Jesus, how He did what He did, and how He sparked a movement with twelve men that has continued and strengthened over the past 2000 years. What was Jesus’ primary mode of leadership? Looking back at the Gospel accounts (Matthew, Mark, Luke, and John, the first four books of the New Testament), we can see that Jesus did a lot of things. Jesus healed the sick, preached to the masses, cleared the temple, stood up to the Pharisees, ate with tax collectors and sinners, walked on water, ultimately died for the sins of the world and took our punishment on the cross. However, in looking at Jesus’ life and ministry, His development of the twelve disciples far exceeded anything else. How did Jesus train His disciples; “time”. We have a resource with FCA called 3Dimensional Coaching, and the premise behind this program is that coaches typically speak to the 1st dimension of the athletes, the fundamentals, x’s and o’s of how to play the game, but in order to be a better coach we must move beyond the 1st dimension to the 2nd and 3rd which are the mind and the heart of the athlete. What must we do to lead the mind and the heart of the athlete? We must “know” our athletes and there is no way to know them without investing the time to understand them. I would call this “relational leadership”. We have been working through a book “Master Plan of Evangelism” here with our staff for the past few months, and recently we looked at the amount of hours Jesus most likely spent with his disciples, lets say 8 hours a day, by 350 days a year (lets say they got 2 weeks vacation), by 3 years and you get an estimate 8,400 hours that Jesus spent with His disciples. Ultimately, in those 8,400 hours we can guess that Jesus taught, laughed, ate, hung out, prayed, etc. all of which created and instilled in them the necessary tools to continue the movement that He started, ultimately leading to us talking about this today. Like I said earlier, I don’t know how many coaches are reading this, but if you are I want to encourage you, your athletes are more than x’s and o’s, your athletes are hearts and minds that are being strengthened and equipped to take the world by storm. 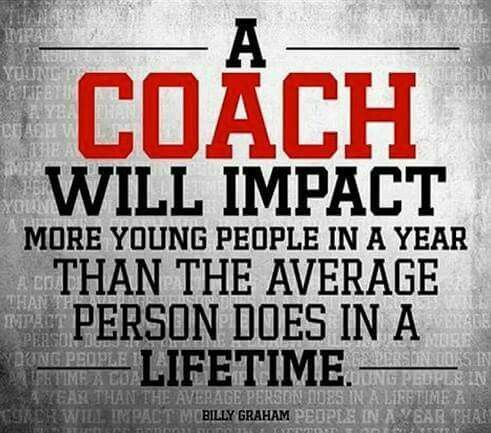 Coaches, you have an incredible amount of influence, you can speak life into your players! Model Christ, spend time, and use your platform to encourage a generation to take the world by storm, and try to win some ball games along the way! Coaches I want to hear from you, if you are reading this, if we can encourage each other, please reach out to me at lsawyer@fca.org.